CyberpowerPC has teamed up with Geil Memory to gift two of their fans with brand new memory kits! To enter in this CyberPowerPC x GeIL RAM Giveaway grab your free entries by following few simple steps listed down below! 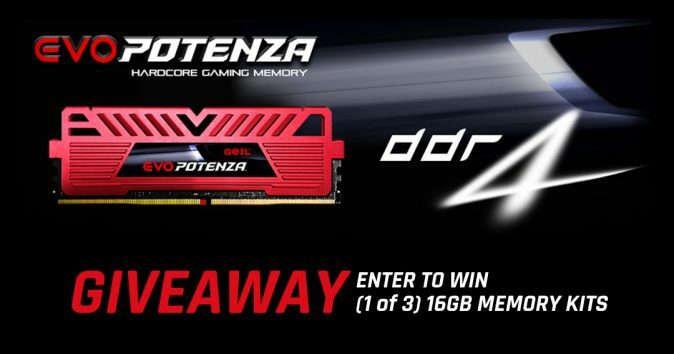 Potenza, the Italian word for “power”, hence the name of GeIL’s latest top of the line DDR4 Gaming Memory – EVO POTENZA. Speed of up to 3200MHz, available in Quad and Dual-Quad Kits, the DDR4 EVO POTENZA is designed for the latest Intel X99 chipset for maximum performance and compatibility. EVO POTENZA is equipped with the Potenza heat-spreader, designed with GeIL’s MTCD – Maximum Thermal Conduction & Dissipation technology for superior cooling efficiency. EVO POTENZA is the new DDR4 performance benchmark that powers up your desktop. Not known how winner is going to be contacted, probably by email and announced in giveaway widget shortly after giveaway ends.